When Baby Jesus disappeared last year from a Nativity scene on the lawn of the Wellington, Fla., community center, village officials didn’t follow a star to locate him. Instead a GPS device mounted inside the life-size ceramic figurine led sheriff’s deputies to a nearby apartment, where it was found face down on the carpet. An 18-year-old woman was arrested in the theft. Abandoning old-fashioned padlocks and plain ol’ trust, a number of churches, synagogues, governments and ordinary citizens are turning to technology to protect holiday displays from pranks or prejudice. In fact, about 70 churches and synagogues eager to avoid the December police blotter jumped at a security company’s offer of free use of GPS systems and hidden cameras this month to guard their Nativity scenes and Christmas displays. 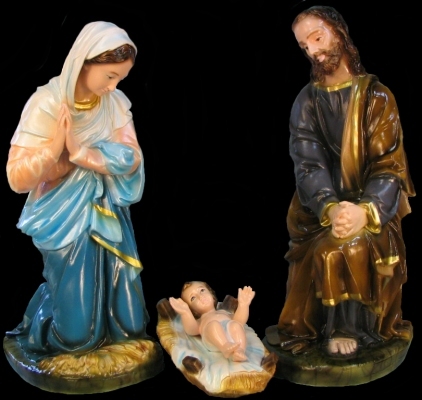 For two consecutive years now, thieves have made off with the baby Jesus figurine in Wellington, a well-off village of 60,000 in Palm Beach County, Fla. The ceramic original, donated by a local merchant, was made in Italy and worth about $1,800, said John Bonde, Wellington’s director of operations. So far in 2008, Baby Jesus has appeared in several police reports. At First United Methodist Church in Kittanning, Pa., a baby Jesus was stolen and replaced with a pumpkin. In Eureka Springs, Ark., someone who absconded with a plastic baby Jesus from a public display last week also took the concrete block and chain that was supposed to act as a deterrent. Now that religious and government organizations are fighting back with technology, thieves beware. What might seems like an innocent prank could cost them some hefty fines as well as jail time.